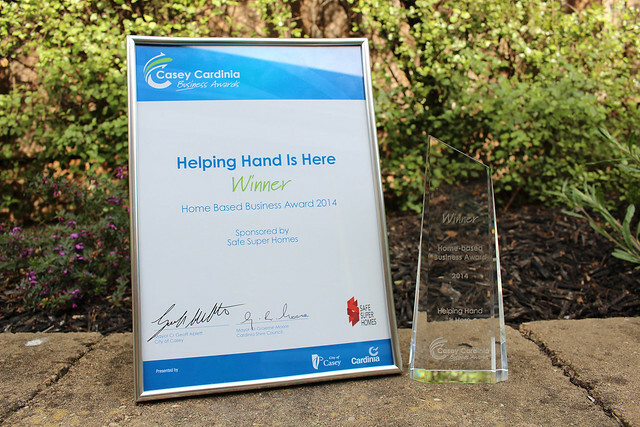 Helping Hand Is Here was announced as a Winner in the Home Based Business category at Casey Cardinia Business Awards 2014 Winner function. It was a pleasure to attend the Casey Cardinia Business Awards dinner and to speak with a number of finalists and recipients. I congratulate Helping Hands is Here on winning the Home Based Business award category and for providing an innovative and much needed service to the community. Congratulations once again to Michelle and to Helping Hands is Here. It was my absolute pleasure to attend the Casey Cardinia Business Awards for 2014 which were held on the 9th of October. My sincere congratulations, and very best wishes, to Helping Hand who were duly recognised for their innovative and invaluable contributions to our community members in the area of Disability Services. Congratulations to you and your husband on your richly deserved award you received at the Casey Cardinia Business Awards 2014. It was a very moving acceptance and the whole room admired your achievements and your humility, your challenges and how you had converted them into something of such important community benefit. My sincere congratulations to Michelle Jankovic from Helping Hand is Here. 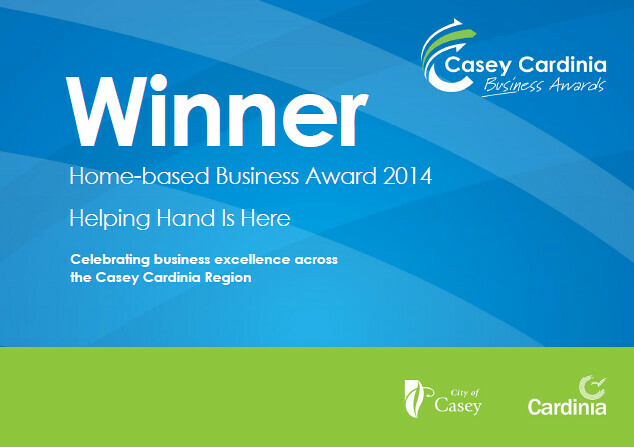 Winning the Best Home Business Award at the Casey Cardinia Business Awards 2014 is not only a testament to her success in operating a business, but also her successes in the field of disability support. Michelle’s ability to harness a difficult situation and convert it into a business that not only benefits a particular group of people, but the whole community of La Trobe, is genuinely one to be admired. I truly hope that her success inspires many others in our community. Helping Hand is Here is just what it says it is. It provides parents, carers and educators with resources that are currently not available and guides them directly resources and support that is so critical to the well being and the development of their children. Congratulations to Michelle on an outstanding achievements that is rightly recognised by the Casey Cardinia business and wider community. We are so proud of and grateful to you! Helping Hand is Here is innovative and fulfils such a need in our community. There are nearly 20,000 home-based businesses in the City of Casey (not to mention Cardinia) and for Helping Hand Is Here to win the best business award in that category is an achievement that speaks volumes about this business. Congratulations and my best wishes for an even brighter future. If anyone needs a helping hand, Michelle Jankovic at Helping Hand is Here, should be the first enquiry made. Michelle has real passion and with considerable experience, in arranging all things for those with a disability. She is a dedicated & skilful lady and will save you from further worries & frustrations. I believe Helping Hand is Here represents a great success story for the region and clearly addresses a void for those in the unfortunate position of having to experience the potential frustrations associated with care for children with a disability. Michelle Jankovic felt all that pain as she sought medical care for her son, who has mild cerebral palsy, and was inspired to strive to make that journey easier for those parents who would follow a similar path. Helping Hand Is Here runs disability services workshops to help better inform families in the Casey and Cardinia region of services available to them – and she is looking to extend that reach in the future. Michelle’s passion for the cause was evident on the night of the Casey Cardinia awards and there was hardly a dry eye in the house as she accepted her well deserved honour in the Home Based Business category.